»House, Garden and Dogs»Walks, Fete and and second dog. Getting much lighter in the morning, but not all that much warmer. The days, however, are warmer and we had a little taste of summer when the temperature climbed up to 35c. That was exciting!! The following day it was 28c then fell back to normal early spring temperatures of 20(ish). However, high 20s – low 30s and the flies are out in force already. 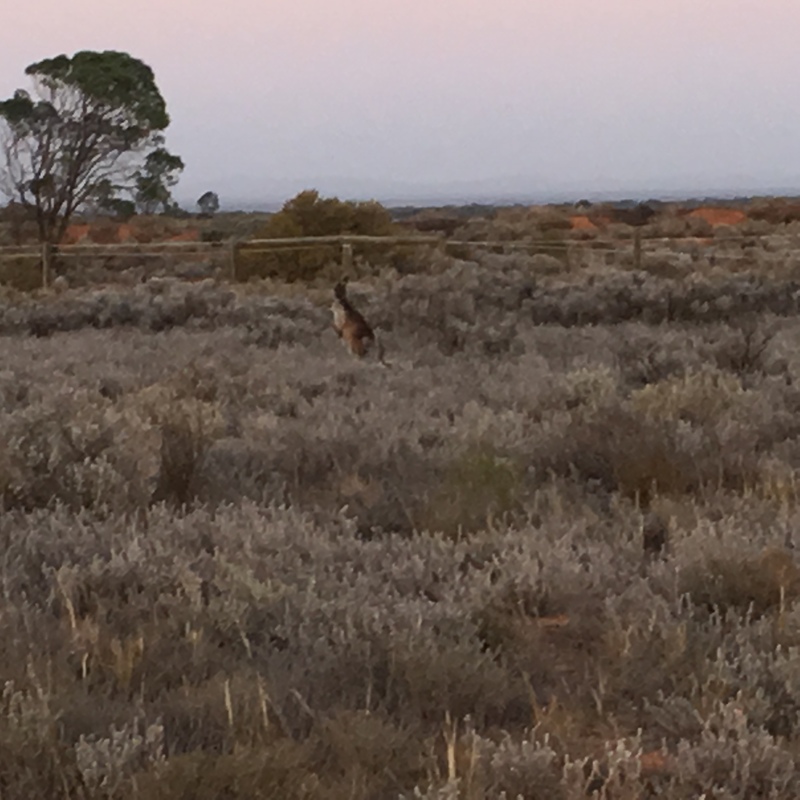 One of the advantages of the light in the morning is that a number of Kangaroos have been gathering at the far end of the fence line. Not that we get anywhere near them as they bounce off before we get even close enough to take a photograph but, still, it’s nice to see them and take what photograph we can. I carry a Nikon with me, it’s not really up to serious photography, but it is easy to carry around. When I go to Mount Gambier I generally take the larger camera with me..
Our clocks went forward an hour so it’s back to dark in the mornings. We had a few days of really nice spring weather then back to sort of late winter – cold, wet and miserable. Today (Saturday 7th) it had been raining much of the night and it’s still raining. We did not go out for our walk this morning, but he still got his morning treat – which I thought only fair because he was up and ready to go. The church mini Fete took place today and given the early heavy rain we were concerned that it might have to be cancelled again. However, by 7:30 the rain cleared and the sun shone brightly. The Fete was well attended and overall we raised over $1400. I paid for it in that I was on my feet for much of the day and my knee has been playing up something shocking. This evening I lay down and read a book – vegged out I think. underdeveloped – the tyranny of distance and a lack of a major water supply. Just driving to the Lighthouse and back is nearly 50 miles. This distance will take you from Glasgow to Lochearnhead or from Edinburgh to Callander ( give or take a couple of miles) Some of you may remember that one of our elderly ladies was moved from here to Quorn Hospital because there were no beds at any of the aged care facilities here. I visited her several times as did some of the other ladies – a round trip of 145 miles. 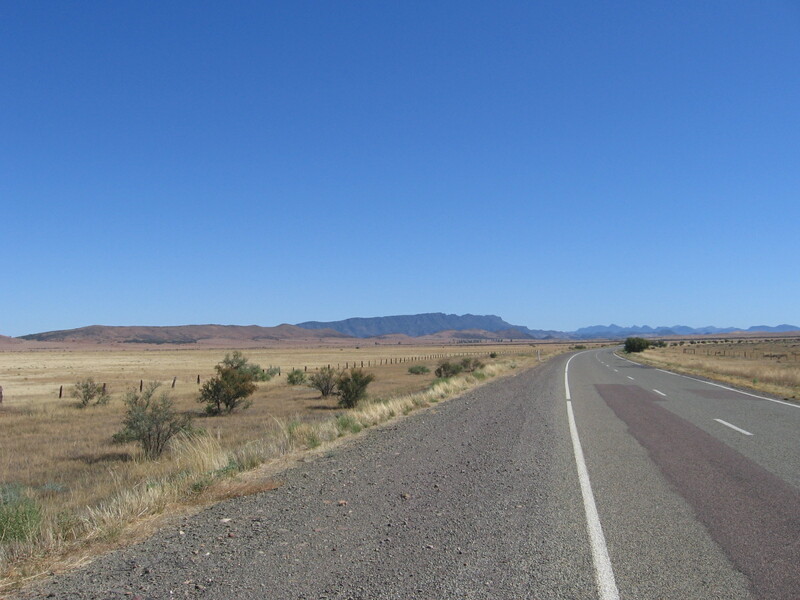 For me the problem is that we here are “inbetweeners” too far north to get the benefit of the rolling landscapes of the south, and not far enough north to get the benefit of the rugged mountain country of the Flinders Ranges. 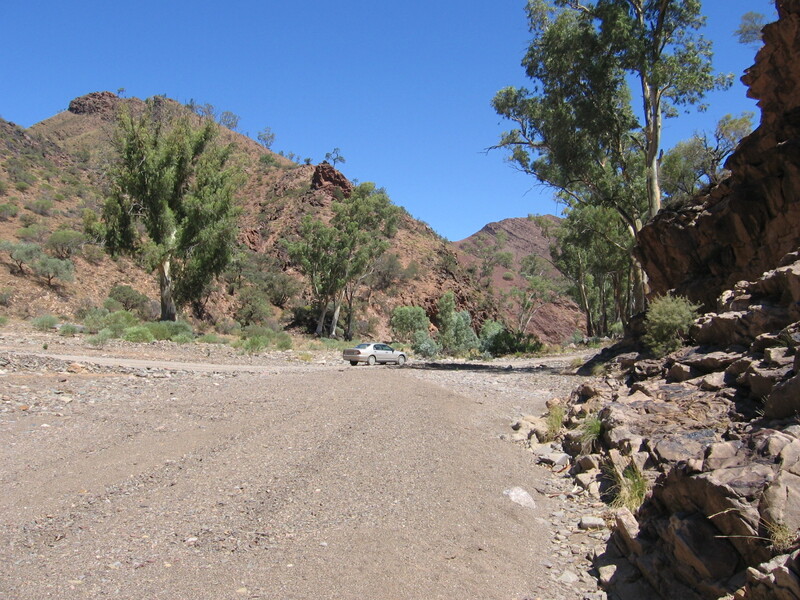 To get to either means several hours driving and of the two I prefer the Flinders Ranges. For the next three days I will have two dogs. When Ina had to go down to the hospital in Adelaide, Irene – a mutual friend – looked after Dougal. Irene is not in town any more so when I was round there the other day getting some things for the Fete, Ina talked about her need to put Dougal into care for a couple of days. I said she was not to do this and she was to bring Dougal round to me and Annabell and I would look after him for the two days. I went home and told Annabell what I had done and she said “good, Dougal is a lovely Shih-Tzu and should be no problem”. Ina brought the dog this evening and after she went home, the three of us- Benji, me and Dougal went out for a walk. Dougal and Benji hit it off and currently they are wandering around outside like old pals. It is interesting to read about spring coming when we are experiencing fall. I know the “other side of the world” is opposite, but this is the first time that I have had a personal connection to make it real. Know what I mean? 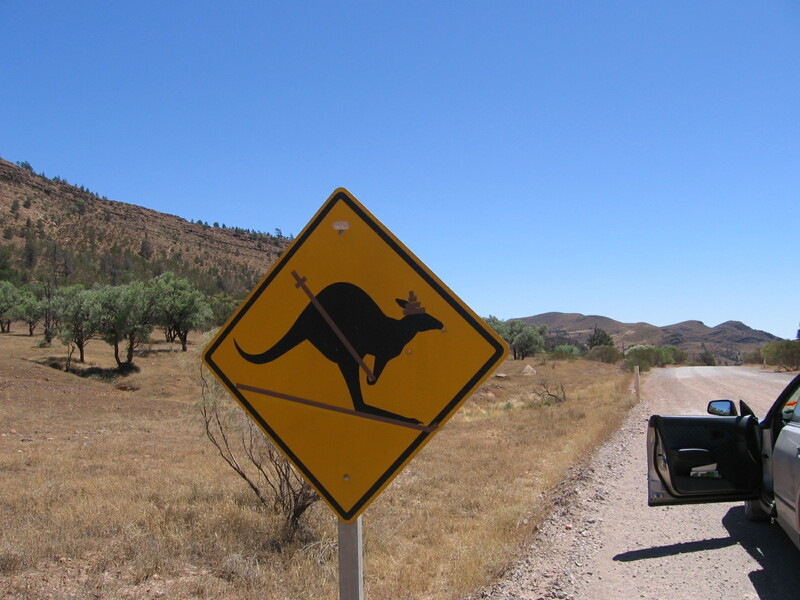 Is that sign of a kangaroo skiing? Glad Benji and Dougal are getting along well. When it is high summer here and the temperature is 43c, you would be surprised how much I will envy your snow. Yes, I was surprised at how quickly they took to each other and wandered around outside together as if they had known each other for years. Glad Benji and Dougal hit it off so well!! I have a little point-n-shoot Canon, but I hardly ever use it. My phone is always with me, and it’s great for photos of the girls most of the time. Though it wouldn’t be much good for photos of kangaroos and koalas. Yes, I was surprised that they sort of bonded right away. I just made sure the gates were closed and locked and left them wandering around outside. I also carry my Iphone with me and that takes good photographs. I thought so too, and that’s why I stopped the car to take a photograph…. One of the advantages of living here is that the traffic is light. In driving to the lighthouse and back it would be rare for me to see more than a few cars – half a dozen at the most Same driving to Adelaide, only traffic is driving through Port Augusta and then light traffic until outside of Adelaide Oh and I cheat, I drive an automatic.